As dentistry becomes more advanced, more people are able to keep their teeth longer. In fact, a century ago, most adults probably did not have all their teeth. Fillings, root canals, regular checkups, and most other dental procedures are designed to keep your teeth firmly in place. However, there are some instances when a tooth simply must be removed. This is why we offer safe and effective tooth extractions at our practice. Tooth extraction is not nearly as common as it used to be. Before modern dentistry, tooth extraction was often the only way to deal with a problematic tooth. This is no longer the case, but some circumstances still make extraction the best choice. The primary reason is when the tooth in question is beyond repair. Sometimes, the decay or damage to a tooth simply cannot be fixed by other procedures. When the situation is this advanced, extraction is recommended. Another reason extraction may be recommended is when there are concerns about oral disease or infection. Some conditions like gingivitis can eventually start to affect your teeth. When this happens, teeth can become loose. At this point, salvaging the tooth may be impossible. Extraction is typically used in order to clear the area for a new tooth to be placed. Tooth extraction may also be used in order to help with spacing. Some people do not have enough room for all the teeth in their mouth. When this happens, overcrowding can lead to pain, discomfort, crooked teeth and other problems. Likewise, this crowding can lead to impacted teeth. When teeth become impacted, the condition is quite painful because one tooth is growing into another. In order to relieve the pain and other complications, extraction is usually required. Due to spacing issues, a replacement tooth may or may not be necessary. 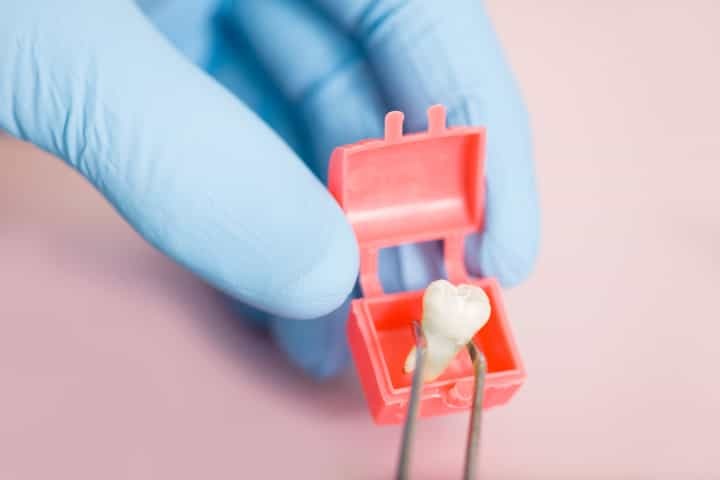 Tooth extraction is often a daunting procedure, but patients should be assured that we use proper anesthesia for every extraction. Anesthesia is the best way to control the amount of pain patients experience during the extraction. Some situations require only local anesthesia, which is injected into the gum to numb the area. However, if the procedure is more extensive, a stronger sedative may be used. Next, the gum is prepared. If the tooth is visible, less preparation is needed. However, if the tooth is impacted or has not yet broken the surface of the gum, then cutting away gum tissue may be required. When a tooth is extracted from inside the gum, forceps and other equipment may be necessary. In extreme cases, the tooth may need to be broken up and removed in pieces. While this may sound disconcerting, it is perfectly safe and normal for our experienced dental team. Once the tooth has been fully removed from the mouth, the dentist will control the bleeding. Usually, this simply requires gauze, which is packed tightly into the empty socket where the tooth once was. If necessary, a few stitches can be placed to keep the area closed. These stitches are typically designed to dissolve on their own in order to limit follow up complications. Despite how daunting the procedure can seem, recovery is generally straightforward. For many patients, painkillers are prescribed for a limited period of time. Patients are sent home with extra gauze, which should be held in place by biting in order to get the bleeding under control. These gauze pads should be changed regularly during the first several hours. If there is swelling, ice can be applied externally. Patients are encouraged to take a full day to recover with limited activities for several more days. The mouth should be rinsed with warm salt water for the first day. Patients are allowed to eat after the procedure, but soft foods are recommended until the socket has healed. In some cases, the socket becomes overly exposed. This is called a dry socket, and it can be quite painful. If this happens, please contact us. We can provide additional pain support until your dry socket has healed. Obviously, tooth extraction is the last resort. Therefore, be sure you have the best dentist for the job. At Aspen Springs Dental, we are proud to help patients with all their dental needs. We have ample experience with all types of procedures, and we can make the process of tooth extraction as stress-free as possible. Contact our office today to learn more.